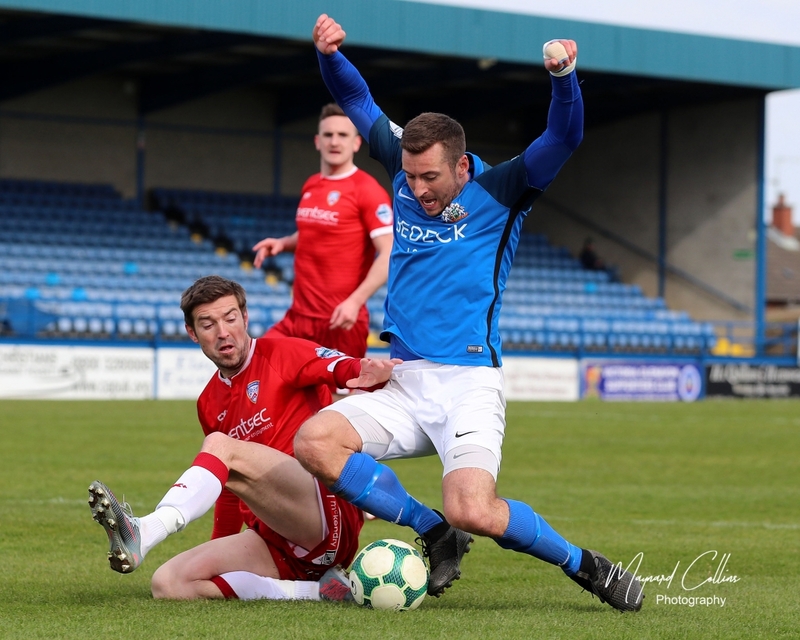 Ben Doherty’s late equaliser cancelled out Sammy Clingan’s penalty as Glenavon and Coleraine played out a 1 – 1 draw at a windswept Mourneview Park on Saturday afternoon. 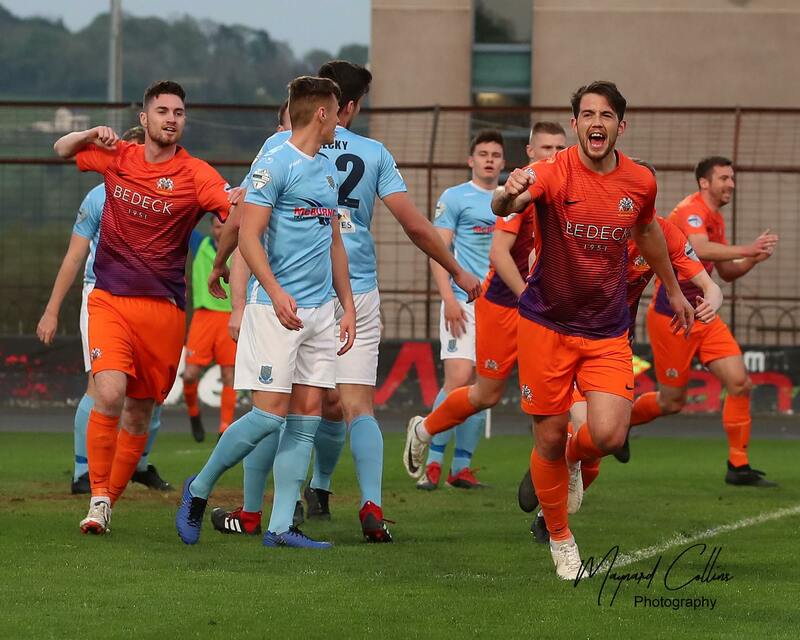 Jonathan Tuffey saved Jamie McGonigle’s penalty in the seventh minute to deny Coleraine, while Clingan, ever-reliable from the spot, converted from 12 yards to give Glenavon the lead shortly after the hour mark. It looked as though the Lurgan Blues would see the game out to pick up a fifth successive league win, but former Glenavon man Doherty equalised for the Bannsiders a minute from time when he fired a low left-footed shot into the far corner after substitute Jamie Glackin had crashed an effort off the crossbar. 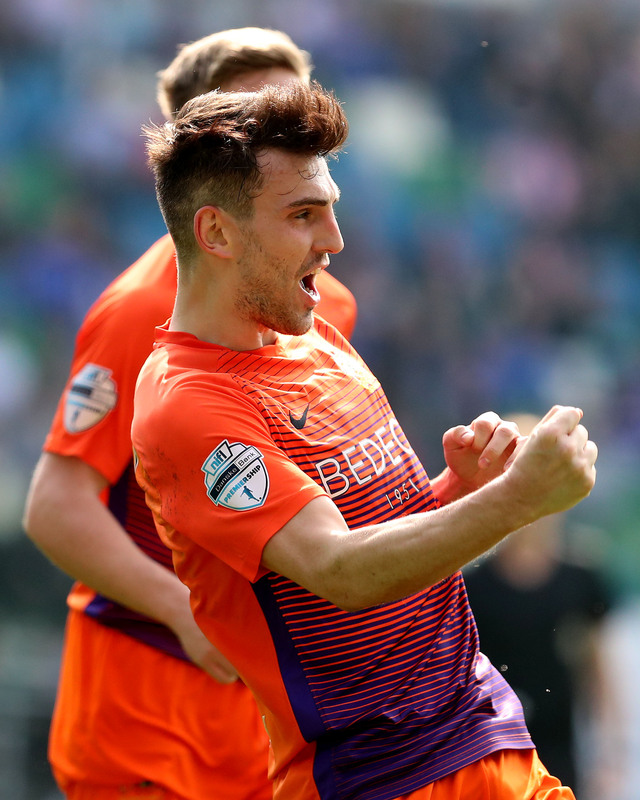 The Bannsiders were presented with a golden opportunity to open the scoring seven minutes into the game when referee Keith Kennedy pointed to the spot. 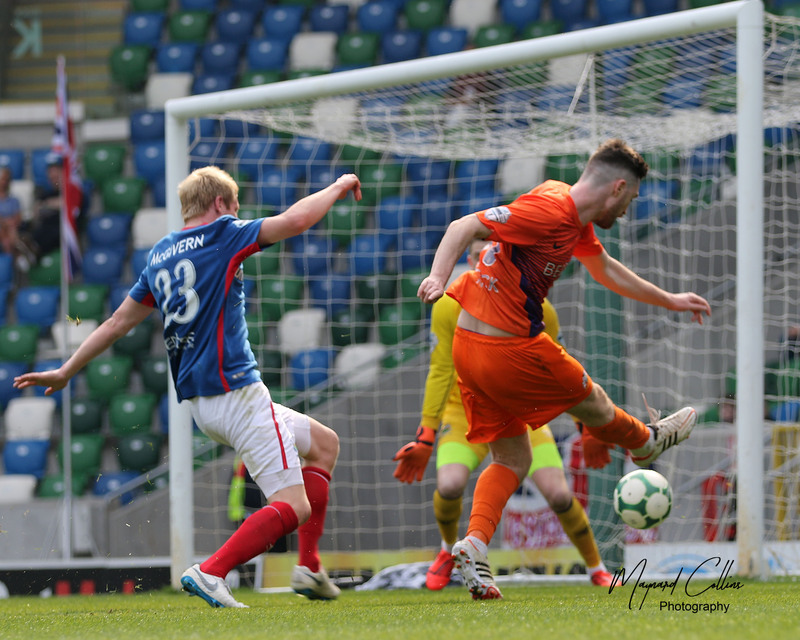 Steven Douglas clipped a lofted pass in behind the Glenavon defence and McGonigle showed an impressive turn of pace to get to the ball first. Wearen’s challenge was clumsy and when McGonigle went down Kennedy had no hesitations in awarding the spot-kick. McGonigle himself stepped up to take the penalty, drilling the ball towards the bottom left-hand corner with his right foot. However, Tuffey’s excellent form between the sticks continued as he dived down to his right and got a strong hand to the ball to make a superb save. 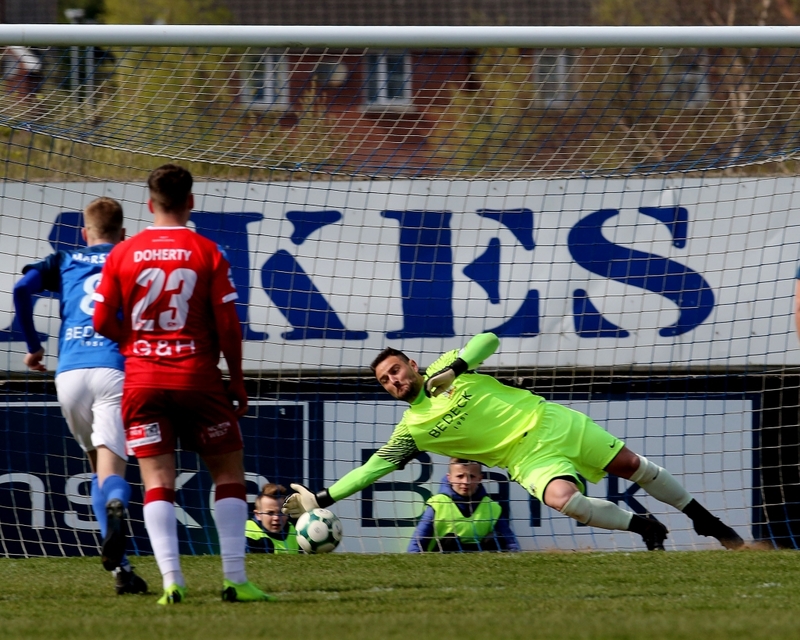 The Glenavon keeper then quickly bounced to his feet and gathered the loose ball to ensure that there would be no opportunity for McGonigle to convert a rebound. Jonathan Tuffey dives down to his right to make a superb save to keep out Jamie McGonigle’s penalty. Photo by Maynard Collins. At the other end, Coleraine captain Stephen O’Donnell had to make a key interception to cut out a Josh Daniels through ball that was intended to send Stephen Murray through on goal in the 13th minute. James McLaughlin flashed a shot wide on 14 minutes for the visitors, while the home side went close a minute later when James Singleton played a one-two with Andrew Mitchell before curling an effort over the bar with his weaker right foot. In the 20th minute Aaron Harmon sent a cross in from the right and Mitchell did well to connect with his right foot and send a volley goalwards, but the ball went straight into the arms of Chris Johns. Three minutes later McLaughlin had a shot at goal with a free-kick but his effort was tame and Tuffey made a comfortable save. Tuffey’s opposite number Johns was tested by Daniels on 26 minutes. The winger cut in from the left and fired a fierce drive towards the near corner with his right foot. Johns dived to his right to make an impressive stop. In the 34th minute Seamus Sharkey and Clingan made blocks in quick succession to deny McLaughlin and Doherty respectively, while a minute later Doherty fired a shot wide with his left foot. There was more impressive defending from O’Donnell on 36 minutes when he cut out a Daniels’ cutback with Mitchell lurking ominously behind him. McGonigle saw his header cannon off the post with Tuffey rooted to the spot in the 40th minute after he’d been picked out by an Aaron Canning cross, but the linesman had raised his flag to signal offside anyway, so it wouldn’t have counted. The blustery conditions meant it was nigh on impossible for either side to play good football, so it was no surprise that the second half started sloppily. The first goal eventually arrived in the 62nd minute, however. Sharkey was caught on the ball by McLaughlin close to the halfway line while trying to carry it out of defence, but just as Coleraine looked to mount a counter attack Harmon got across to cover well and won the ball back from Ian Parkhill. Singleton then played a long ball down the left flank which was flicked on by the head of Mitchell for Murray to run on to. The striker’s first touch with his left foot took him into the penalty area. Douglas came across and slid in to make a tackle, and when Murray went down Kennedy decided that it warranted the awarding of a penalty. The Coleraine players were incensed and appeared to suggest that Murray had gone down too easily and duped the referee. The incident involving Steven Douglas and Stephen Murray which resulted in Glenavon being awarded their penalty. Photo by Maynard Collins. Clingan stepped up to take the spot-kick for the second week in succession and the outcome was never really in doubt. The veteran midfielder sent Johns the wrong way as he stroked the ball inside the left-hand post to make it 1 – 0 to the Lurgan Blues. Clingan was involved again five minutes later when he had an effort on goal from a free-kick, but the impressive Johns was equal to it, tipping the ball over the bar. On 78 minutes Rhys Marshall picked Daniels out with a cross-field ball and the winger’s header in behind was won by Murray, but the striker could only shoot straight at Johns. As the minutes ticked by it looked like Glenavon would hold on to secure another vital three points, but just a minute from time Coleraine found the equaliser. Canning chipped a long ball up to the edge of the Glenavon penalty area which picked out McGonigle. With his back to goal, the young forward kneed the ball down into the path of Glackin. The substitute took one touch to set himself before hitting a rasping shot with his right foot which smashed off the crossbar. Dean Shiels did well to keep the ball alive, holding it up close to the byline before feeding it back to Aaron Mullan on the edge of the box. The left-back then played a short ball infield to tee up Doherty 20 yards out from goal. 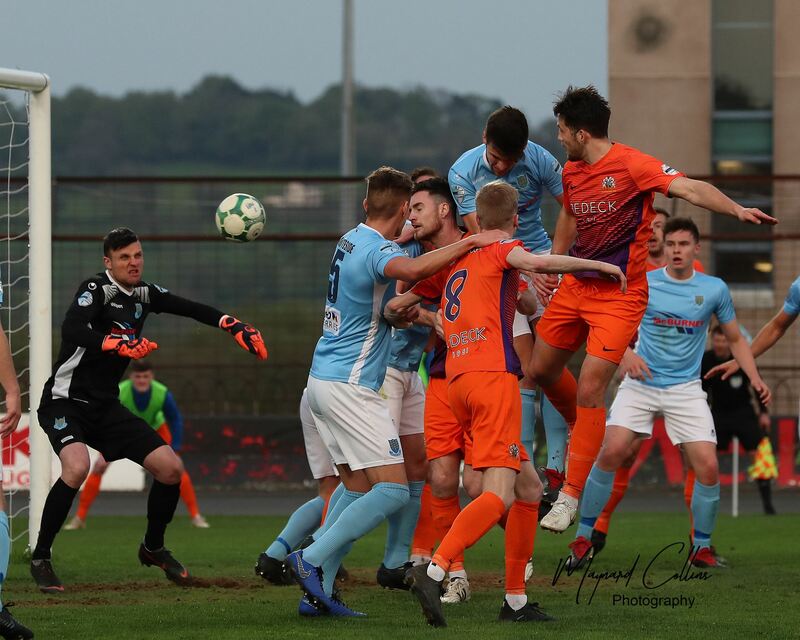 The former Glenavon player struck a low left-footed shot first time which arrowed through a crowded penalty area beyond the dive of the unsighted Tuffey and into the far corner to make it 1 – 1. Glenavon might have won it right at the death. Despite taking a deflection off the wall, Clingan’s free-kick from 25 yards was goal-bound, and it required another great save from Johns to keep the ball out of the net as he dived up to his left to palm the ball over the bar and ensure that it ended honours even at Mourneview. 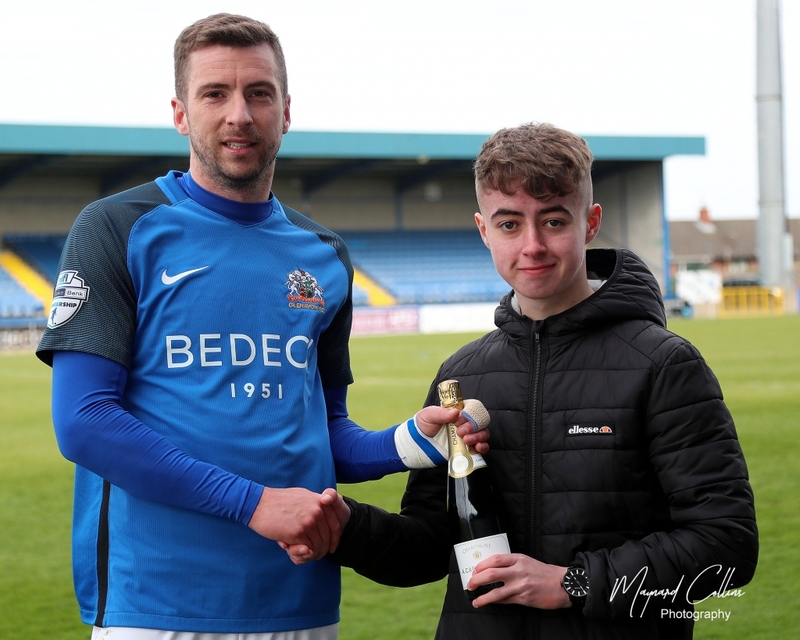 Stephen Murray receives his Man of the Match award following Saturday’s game against Coleraine. Photo by Maynard Collins. 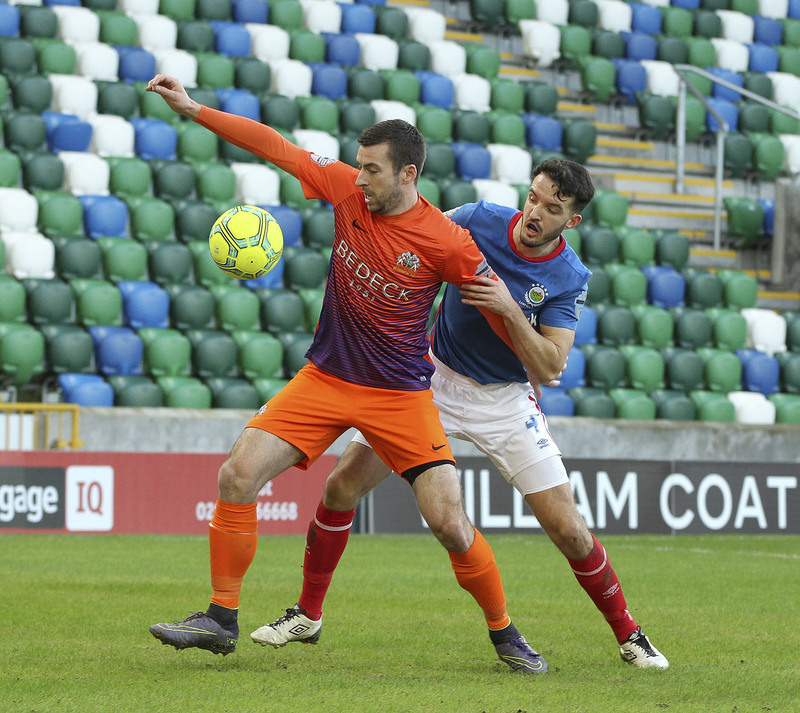 Next Saturday (20th April) sees Glenavon travel to Windsor Park to take on newly crowned champions Linfield (kick-off 3pm).